The first step in building on existing efforts is to compile an assessment of existing efforts underway in the region that relate to the plan’s Big Ideas and Priority Strategies. The Implementation Report establishes a framework for documenting the efforts in a central location. It is not intended to be a comprehensive assessment of all efforts in the region. As additional efforts are learned about they can be added to this report. Particular emphasis has been given to document regional, large-scale, or best practice initiatives. The intent is that this report will be produced annually to document the implementation progress of Our Great Region 2040. 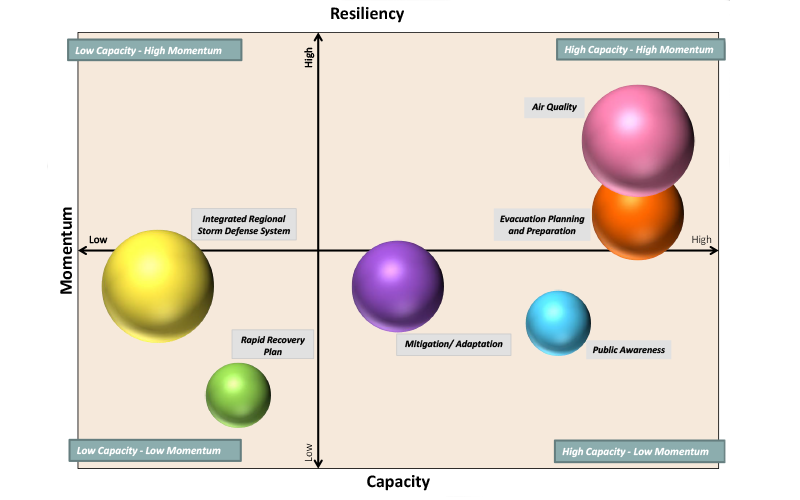 This chart illustrates how successful a strategy may be by delineating its potential momentum and capacity in a regional context. More details about the strategies are available in the Implementation Report and in the tabs below. Improve the opportunities for lifelong learning by scaling up and coordinating efforts, from quality early childhood education to GED and community education programs to skills training for seniors. Does your organization have an initiative supporting this strategy that is not currently listed? Add it to the list. Expand programs to improve job and financial skills and promote self sufficiency. Increase availability of information on job skills needed by employers to educational institutions, allowing them to better tailor their course and training offerings. As job skill needs shift with changing market conditions, keeping educational institutions, trainings and course offerings flexible and current. Promote business attraction and retention efforts through multi-jurisdictional coordination and financial incentives. Increase availability of high speed data connections and broadband Internet across the region, especially in rural areas. Institute a “buy local, make local, grow local” campaign to support local businesses. Work together on long term structural solutions to increase water storage and distribution capacity. Gathering: while there are regional level organizations with technical expertise in the subject matter of this strategy, there are significant political and financial challenges to its implementation. High: the drought of 2011 made the issue of water supply a high momentum strategy throughout the region. Create watershed protection plans to protect recharge zones, and water sources, as well as waterways and wetland buffer areas. High: several organizations currently pursuing this strategy that have successful plans that can act as models for further implementation of this strategy. Gathering: momentum will likely build as watershed protection plans are implemented but there is currently not an institutional framework for implementing many of the strategies at a watershed level. Conserve natural assets through multi-benefit green infrastructure projects and designing with nature, such as Low Impact Development and expanding Our Region’s network of open space and trails along waterways. High: there are several significant initiatives within this strategy underway in the region and a growing level of technical expertise in the public and private sectors. High: increasing interest in Low Impact Development by developers and local governments. 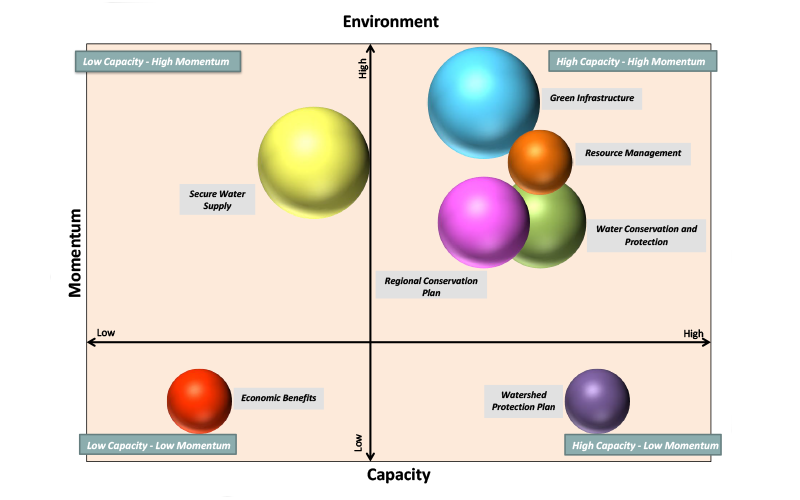 Increase awareness of the economic benefits of environmental systems. Texas Coastal Exchange – a concept for a web-based system for buying and selling ecological services, being developed by Jim Blackburn. Low: there remain significant data limitations and few ongoing initiatives. Gathering: Although there is momentum for individual projects to document economic benefits, there does not appear to be a high level of regional momentum for this strategy currently. Establish alliances to coordinate water conservation and protection efforts across Our Region, including sharing data and best practices, developing financial incentives, and implementing public awareness programs. High- Several organizations in the region have existing, successful initiatives under this strategy that could be built upon to further implementation of this strategy. High - Participation in existing efforts, such as Trash Bash and other public events, has grown over the years, indicating a rising level of momentum for this strategy. There is increased awareness of the need for water conservation in light of recent droughts. Develop a regional plan to conserve high quality natural areas. Houston Wilderness is leading the development of a Gulf-Houston Regional Conservation Plan. High - The existing initiatives underway under this strategy may provide a solid start to the implementation of the strategy. High - There are already initiatives underway at the regional level to implement this strategy and strong interest across the region. Promote efficient resource management, including energy, solid waste, and water. High - There are many successful local and regional initiatives currently underway supporting this strategy. Organizations, including regional level organizations, have the technical expertise to further this strategy. High - There are existing initiatives that could be expanded through new partnerships. Establish regional infrastructure and distribution mechanisms to support farmers markets and other means to provide fresh, healthy food to residents across Our Region. Gathering - There is an increasing number of initiatives in the region that can be successful models for future projects, as well as growing organizational capacity. Some challenges, such as funding sources, remain. High - There is an increasing awareness and demand for healthy local foods. Existing initiatives have had success in many communities in the region. Increase current funding and identify innovative funding sources to develop and maintain sidewalks, bikeways, bike-share infrastructure, and parks/open space that promote a more active lifestyle. High - Although existing organizations may have limited ability to increase funding, the large number of initiatives being pursued in the region and the technical expertise toward implementation give this strategy high capacity. High - There are many existing successful initiatives and organizations working toward bicycle/pedestrian and open space projects in the region. Create a regional task force that works across multiple disciplines (health departments, public safety, etc.) to address mental health issues. Low - There are few existing initiatives to build upon to implement this strategy. Low - There are few region-wide organizations that are currently working on this strategy that could spearhead the formation of a regional task force. Foster neighborhoods that put an emphasis on health, incorporating elements that promote active living, social interaction, and healthy eating that allow for aging in place. Healthy Kids Houston community-based obesity intervention program encourages children to make healthy lifestyle choices. High – There are many successful initiatives in the region that can serve as models for additional projects. There are many organizations, both public and private, that are incorporating components of this strategy into their neighborhoods or developments. High – Growing interest, organizational capacity and funding. 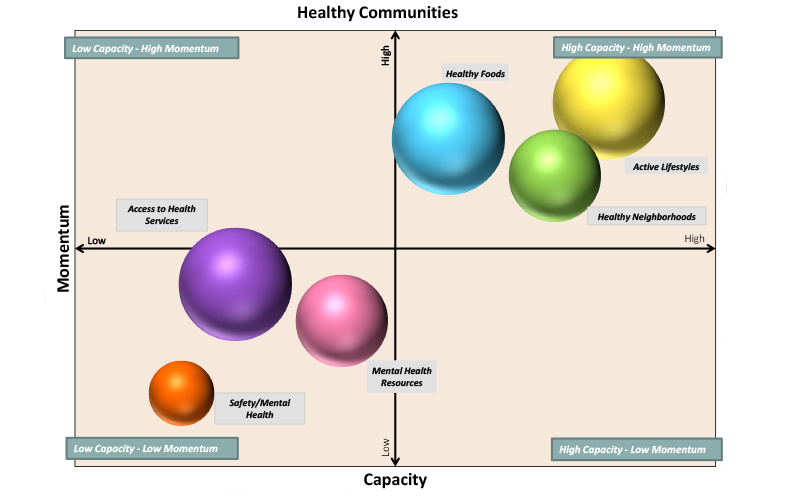 Identify and promote existing and emerging community resources for mental health services. Gathering - There are several existing organizations and initiatives pursuing components of this strategy that could be built upon. Expand availability of community health services and trauma care, particularly in low-income and rural areas. Low - Additional partnerships are needed as much of the technical expertise needed to implement this strategy is limited to health provider organizations. Gathering – Growing awareness of the need to expand the availability of local health services. 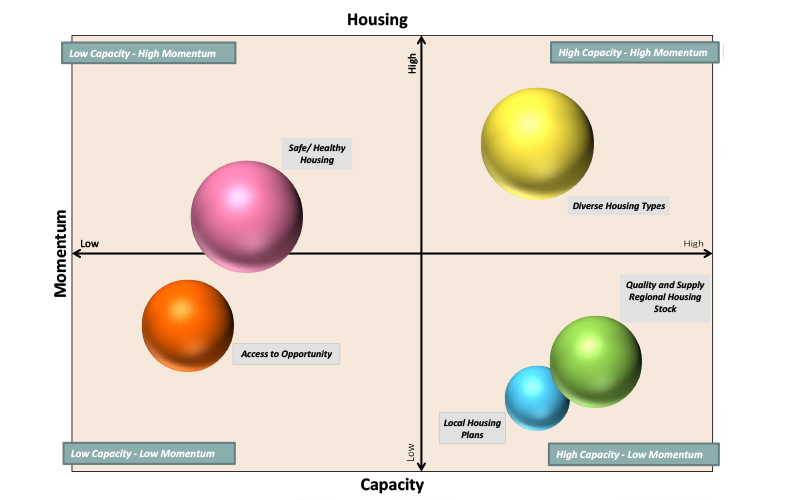 Develop local housing plans to accommodate future growth. High - Many municipalities in the region currently complete Fair Housing Plans/Analysis of Impediments, a prerequisite for being eligible to received federal entitlement grants such as Community Development Block Grant (CDBG). The expertise utilized to complete these plans could be extended to address other housing issues, such as accommodating future growth. Some municipalities in the region also address housing needs through comprehensive plans. Provide financial incentives for developers to build diverse housing types near jobs, transit centers, and services, including mixed-use developments and housing that has a variety of price points . High - Several municipalities in the region are currently pursuing this strategy and there is a high level of expertise in the region. Many studies, including 18 Livable Centers studies, have examined the application of this strategy in different parts of the region. High – There is a high level of interest across the region in efficiently coordinating land use and transportation to help increase access to opportunity, improve mobility, and accommodate all populations. Develop incentives and a toolkit for matching and maintaining local housing stock to meet economic development needs, bringing greater access to opportunities. Low - There are not currently regional level organizations addressing local housing stock issues. Locally the capacity will vary depending on the municipality and the specifics of the housing stock and economic development need. 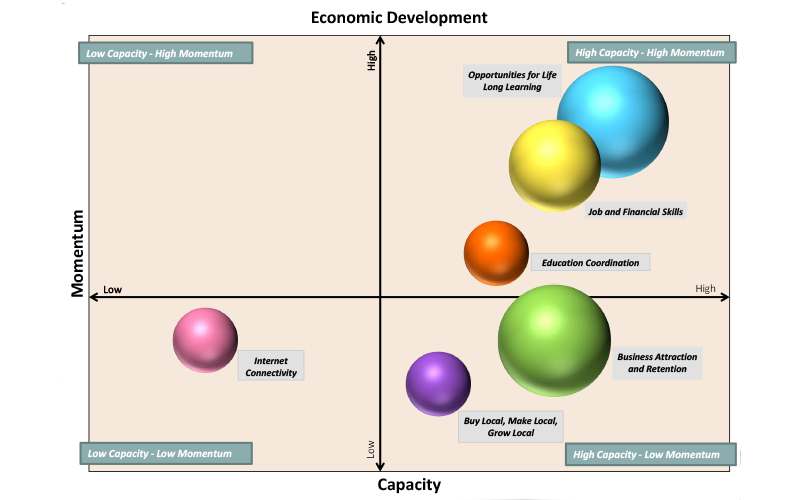 Low - Local municipalities vary on their economic development needs and housing stock. Identify gaps and opportunities of the quality and supply of the regional housing stock, including housing for seniors or aging in place. High - The technical expertise to achieve this strategy exists in the region, both at the local and regional level through existing organizations. Participants at the IN event identified this strategy as being the most likely housing strategy to be achieved in the next five years. Low – As housing is generally viewed as a local issue, there is currently a low level of momentum to pursue regional level housing strategies. Develop and enforce local housing codes and standards to ensure owner-occupied and rental housing is safe and healthy. Low - Counties in Texas do not have building codes and many municipalities do not have the funding to comprehensively inspect and enforce local housing codes. Gathering - Sub-standard housing is an issue that resonated throughout the region. Improve the efficiency of freight movement by investing in projects that improve connections between ships, trains, and trucks. The H-GAC Regional Goods Movement Study. Texas Department of Transportation Houston Region Freight Study identifies improvements that could be made throughout the region to improve freight movement. High- The technical expertise to conduct freight planning exists in the region and several organizations are pursuing initiatives related to this strategy. High - As the region’s ports continue to experience growth, the need for an efficient freight system has continued to grow as well. Optimize existing transportation network through a "Fix it First" strategy and by using technology and improved incident management to maximize system capacity. High - The technical expertise to implement this strategy is already in place in the region. There are many existing successful initiatives and organizations pursuing this strategy that can be built upon. Gathering - With increasingly limited transportation funding there is an interest in maximizing the efficiency of the existing system. Create a regional framework for expanding transit across Our Region. Gathering - The technical expertise to create a framework exists in the region as there are regional level organizations currently working in the transit planning realm. However some significant challenges to developing a framework for regional transit remain, including funding. Gathering - Several recent transportation studies have documented a strong interest for increased transit in the region and several local communities have expressed a desire for specific transit investments. As the region continues to grow having a strong regional transit system will help provide alternatives to driving alone. Develop and implement policies that improve transit, pedestrian and bicycle access between and within activity centers, connecting residents to job centers. High - There are many existing successful initiatives in the region that can be built upon as a model for additional initiatives. There are both local and regional level organizations with the technical expertise to implement this strategy. This strategy received the highest number of votes from IN participants as being the transportation strategy most likely to be achieved in the next 5 years. High - An increasing awareness of the health and mobility benefits of transportation alternatives has generated momentum for pursuit of this strategy. Provide counties with tools to better coordinate land use and transportation planning in unincorporated areas. Low - There are significant hurdles to the implementation of this strategy, including that it would require changes in current legislation. There are not currently local models/best practices that could be built upon. Low - There are not currently any organizations that are pursuing this strategy and there are not any dedicated funding sources. Include economic, safety, and quality of life costs and benefits of transportation projects in funding prioritizations. Gathering - There are few dedicated funding sources that can address this issue, and although there are organizations that have the technical expertise to help quantify costs and benefits, there remain data gaps. 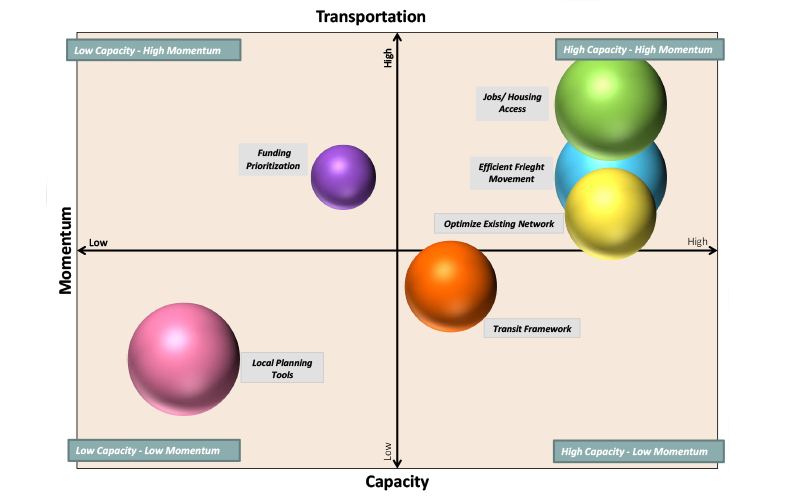 High - There is an increasing recognition that a holistic approach to funding prioritizations may present a fuller picture of the costs and benefits of transportation projects. Create public education programs on wildfire, flooding, and other risks. High - Many organizations in the region, both regional level and local, have expertise in education programs and campaigns. There are many existing education efforts and coordination and economies of scale may be able to be achieved through partnerships on future education programs. Develop an integrated regional storm defense system, which includes both structural and non-structural elements. Low - Development of an integrated regional storm defense system will be a new undertaking for our region. Although there are precedents elsewhere, it will take a concerted and coordinated regional effort to achieve. Gathering -There is an increasing urgency, especially among coastal cities in our region to better prepare for storm events, both through structural and non-structural means. There are many municipalities and organizations in the region focused on this issue, although they are not always coordinating efforts. Enhance coordination of evacuation planning and preparation efforts, particularly to address the needs of vulnerable populations. Houston TranStar is a partnership responsible for coordinating the planning, design, and operations of transportation and emergency management in the greater Houston region. City of Houston Parks and Recreation Department’s emergency management plan, provide community center as shelters. Reaching vulnerable populations, especially those that may not be English speakers or utilize traditional media sources in advance of emergencies, for example to register them for evacuation assistance. High - There are many existing agencies and partnerships, including regional level organizations that are successfully implementing emergency management operations in the region. Gathering - While there are many existing initiatives relating to this strategy, its priority level tends to wane in the absence of major storm events. Develop a rapid recovery plan to help people and businesses return as quickly as possible. Gathering - The Rapid Recovery Pilot Housing Program will provide a strong template for the region to implement. The program is fostering new partnerships and generating the expertise to implement this strategy. Low – as yet, there appears to be limited momentum on moving this forward on a large scale. Improve regional air quality and reduce regional greenhouse gas emissions by offering alternative modes of transportation, improving energy efficiency, and effectively managing resources. High - There are many existing initiatives and organizations, including regional-level organizations, currently pursuing elements of this strategy. There are successful initiatives that can be built upon for other areas of the region. High - There is a high level of momentum for this strategy as alternative modes of transportation gain traction in the region, building on successful existing initiatives. Support innovative adaptation strategies that help communities prepare for potential environmental changes, such as sea level rise and severe weather events. Gathering - There are technical experts in the region that have the expertise to further implementation of this strategy if successful partnerships can be developed. Gathering - There is not consistent support for the strategy among other potential partners. There are few existing successful initiatives and partnerships to build upon.